The right bed can turn your bedroom into a cosy private retreat. When shopping for a bed, consider the functionality you need, such as a headboard or storage underneath, and the home decor style of your bedroom. Whether you like classic designs or contemporary ones, our collection of the latest double bed designs will have something to suit every taste amd need. The bedroom is the place where you relax after spending a busy schedule day. Not only the lighting and curtains but also the furniture that you choose play an important role in setting the mood in the room. Whether you have a classic bedroom in mind with a four poster and sheer curtains, or a simple, contemporary one, our collection of the latest bed designs will have it all. Modern bed designs are all about simplicity of form and focus on function. Clean lines, straight edges, and no-fuss detailing are hallmarks of these. Some such double bed designs also come with storage in the headboard or under the bed to help you make the most of your space. Easy-lift hydraulic storage beds are perfect for small rooms while beds with storage drawers or box storage work for larger rooms. Some bed designs come with a platform all around on which you can keep your nighttime essentials like medicines, spectacle case, or even a book. If you browse classic bed design pictures, you will realise that they are all about expansive form, ornamental details, and other traditional elements. Button-tufted headboards, upholstered sides, and sleigh-bed forms are other trademark classic design elements. A lower bed makes your room look larger and is also toddler-friendly. On the other hand, seniors may find it difficult to get in and out of it. So, you may want to add to the bed’s height with an extra-thick mattress. Our catalogue also has a wide range of single bed designs well-suited for a kids room, bachelor pads, hostels, or sparingly-used guest rooms. The design of the bed that works for you depends on your specific requirements, whether it is storage, display, style, or something else. Our bed design images will give you lots of ideas to style your room, from choosing a bed style that works for you to the right bedroom accessories. Explore all new bed design pictures on Urban Ladder and take home one that works best for you! The Rovan is an adaptation of the Boston bed from Urban Ladder. Its gently curved headboard is a wonderful contrast to the straight lines and clean angles at the foot of the bed. If a stylish wooden-finish headboard is what your heart is set on, the checkered design of the Valencia bed might catch your fancy. Avant-garde design for the stylish bedroom! It is also available with or without storage. Urban Ladder offers furniture design options like these at the best prices in India. The Stockholm is a designer bed which is a perfect example of urban-chic at an affordable price.The Kansas bed, with a slatted headboard, is one among many options if you are looking for beds with headboards. Do make sure you explore the entire range of beds storage, non storage, single, king and queen available on Urban Ladder before you buy your bed. The Tahiti is unique bed design, exclusive to Urban Ladder. A platform bed, designed to capture the luxury of an island getaway. The Ohio is the ideal choice for an elegant bedroom. It is a confident style statement in the guise of a stylish bed for your home at the most affordable price. 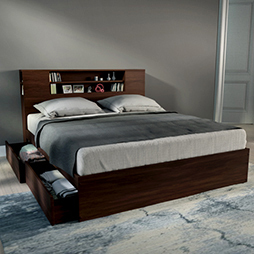 The Athens bed combines clever design and functionality. The Chantilly is quiet elegance. The Georgia is an arresting combination of old world style and streamlined sophistication, perfect for modern day bedrooms. The Yorktown and Baltimore are simple confident bed designs, which add style to any bedroom. With such a huge catalogue of beds online, you will definitely find what you are looking for. We are constantly adding news designs to our catalogue, so come back for fresh designs, and new takes on old favourites.